For nighttime adventures or emergency situations, no other LED headlamp rechargeable provides the versatility and functionality of the 280-lumen INOVA STS PowerSwitch Rechargeable Headlamp. This innovative headlamp LED is the first ever rechargeable, dual-power, waterproof, two-color, multi-mode headlamp. Transform your outdoor adventures, keep in your home or car for all-weather emergencies, or use while working in lowlight conditions. This one-of-a-kind LED headlamp has a dual-power source: runs on included rechargeable 3.7V lithium ion battery pack (1100mAh) or three AAA batteries. This means no delays in waiting to use your light while it recharges. Red LEDs will blink three times when battery life has 5 minutes remaining in high mode. Recharges in approximately 2 hours. The Nite Ize INOVA STS PowerSwitch Rechargeable Headlamp has a waterproof, impact-resistant, durable polycarbonate body designed around the Swipe Pad, with Swipe-To-Shine (STS) technology that allows you to change light modes by swiping or holding fingers on the Swipe Pad. Change between white or red LED headlamp light, and between four modes: high, variable dim, strobe, and lock-out. Use lock-out mode to keep the headlamp turned off while transporting or storing. Made for all kinds of environments, the INOVA is waterproof (IPX7) and impact-resistant (drop-proof up to 2 meters). Adjustable elastic strap is strong and comfortable, with a snug fit. Weighs just 2.3oz. and measures a compact 2.5" x 1.9" x 1.8" for high-performing portability. 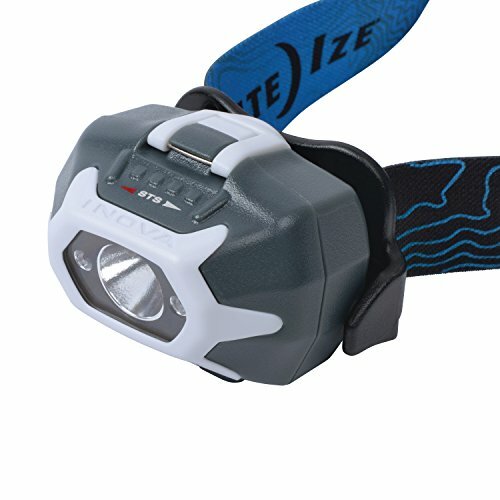 INNOVATIVE NITE IZE HEADLAMP LED - For nighttime adventures or emergency situations, no other LED headlamp rechargeable provides the versatility and functionality of the 280-lumen INOVA STS PowerSwitch Rechargeable Headlamp. RECHARGEABLE OR ADD BATTERIES - This one-of-a-kind LED headlamp has a dual-power source: runs on included rechargeable 3.7V lithium ion battery pack (1100mAh) or three AAA batteries for no light delays while charging up. HIGH-PERFORMANCE DESIGN - The waterproof, impact-resistant, durable polycarbonate body of the PowerSwitch is designed around the Swipe Pad, with Swipe-To-Shine (STS) technology that allows you to change light modes with ultimate ease. MULTIPLE LIGHT MODES INCLUDING LOCK-OUT - Change between white or red LED headlamp light, and between four modes: high, variable dim, strobe, and lock-out. Use lock-out mode to keep the headlamp turned off while transporting or storing. COMFORTABLE AND LIGHTWEIGHT - Direct light where needed with 90-degree tilt angle headlamp LED. Adjustable elastic strap is strong and comfortable, with a snug fit. Weighs just 2.3oz. and measures a compact 2.5" x 1.9" x 1.8" for high-performing portability.